ClearSpan creates premier trade show and convention solutions. 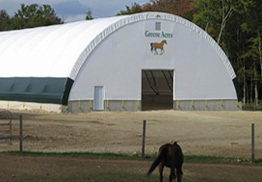 These buildings offer unique designs that provide ample height and extraordinary clearance, and enable shows and conventions to be held year-round. There are no internal columns to interfere with exhibits, stages or viewing areas, and the structures provide the finest acoustics. Guests attending trade shows or conventions in a ClearSpan building will experience an inviting, enjoyable environment with plenty of ventilation. Whether it’s for convention centers, exhibit halls, large public fairs, concert venues, trade shows or anything else, ClearSpan has a building to suit any trade show or convention need. It offers unrivaled gaming, dining and recreational experiences. The four star resort also offers a 100,000 square-foot outdoor events piazza and a 390 room hotel, which provides sweeping views of the greater Las Vegas area. As a four star resort, officials also explored ideas to provide guests with a sheltered breezeway so that guests could get from the casino to the M Pavilion in a safe and comfortable manner. As a result, ClearSpan designed and engineered a 19′ wide by 64′ long breezeway, providing patrons with easy access to and from the venue. At 25,200 square feet, ClearSpan’s Hercules Truss Arch Building, which is now the M Pavilion, is a welcome addition to the resort. The versatility and flexibility of the structure allowed M Resort to also equip the building with a customized interior liner and R-30 insulation package to create a climate controlled environment for the property’s guests and performers. “Because of the way the building is engineered, we are able to use the space in a variety of ways,” Stiles stated. 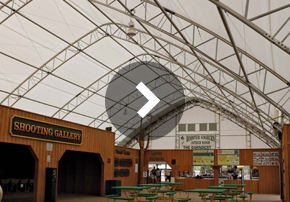 Our trade and convention buildings come in fabric, hybrid and metal buildings, ensuring that no matter how you plan on using your ClearSpan structure, there is an ideal option.